Signs and symptoms of facial trauma are quite visible. The area affected is usually swollen, bruised and easily diagnosed. In severe cases, the facial bones are affected and even fractures can occur. Normal functioning of nose and mouth are affected. Some teeth are also broken in many cases. Double vision occurs in the patient due to the swelling around eyes and improper eye functioning. Fractures of nose, maxilla or base of skull can be present along with profuse nosebleeds. Many of the times, the cheekbone depression can be seen which indicates that there is a chance of some facial bone fracture which can be detected with the help of radiographs. When the patient arrives at the dental clinic, the dentist examines the patient. This is done checking the presence of bleeding, lacerations, damage to the normal structure of the face. Diagnosis of facial trauma is usually made with radiography. This is accompanied by angiography in order to locate the areas of bleeding initiation. This is useful in cases where there are more chances of profuse bleeding with the occurrence of fractures. CT scan is recommended when complex bones and tissues are involved in the fractures. This helps in the understanding the case clearly and determine the right treatment for the patient. 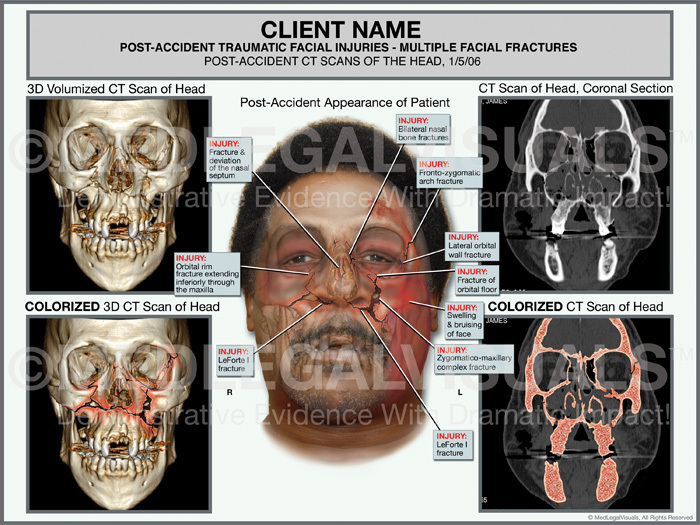 Moreover, CT scan is actually the best in order to detect the facial trauma. Facial trauma can be categorized according to the occurrence in the children or adults. This is due to the fact that both of the facial traumas are different as children don’t have fully developed face. So special care is taken by the doctors so that there is no complication in future and the healing can take place along with the growth of the face of the child. Facial trauma is much less common in children. Less than 5 percent of the children are affected by the facial trauma. Even if it occurs the main cause is falling on the ground or some place usually while playing. For children who are above 5 years of age, vehicle accidents are one of the main causes. But due to various preventive measures taken like correct usage of car seats and seat belts. Treatment of facial trauma is done by focusing mainly on the esthetics as well as functioning of the parts affected. Most important aim is to control bleeding. This is done by the surgeon by taking proper measures at the time of surgery. Care is taken to prevent any obstruction in the airway of the patient. One this is done then broken bone segments are fixed with the help of titanium plates and screws. Treating the fracture and leaving the minimal scars to make the esthetically confident. Doctor should be alert and immediate treatment action must be taken to avoid any complications.